Home > Odyssey Log > Blue Planet Odyssey Update: So where are they? 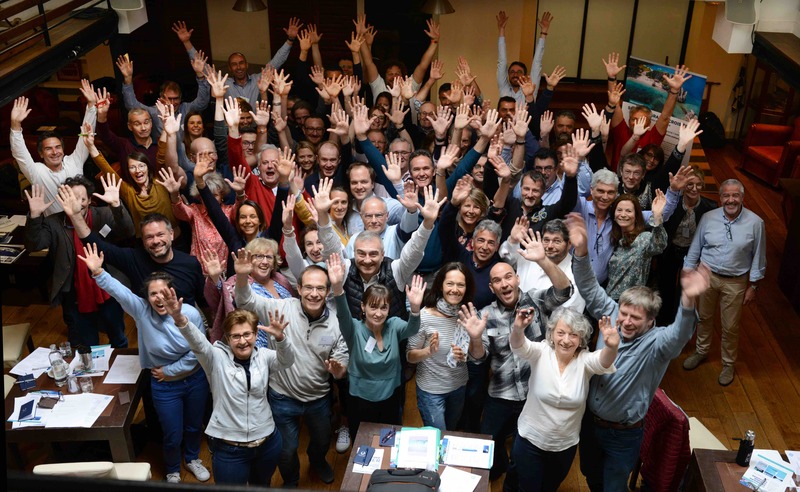 As the southern part of the Blue Planet Odyssey gets well and truly underway, we will be bringing you regular updates from the boats – extracts from their blogs, photos, and any other news we can glean from the places and ports they visit. 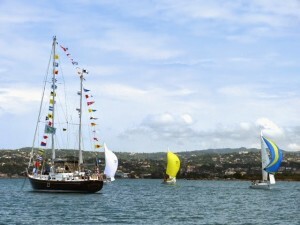 At present, one part of the fleet is underway having left Martinique on Sunday 18 January, bound for the San Blas Archipelago. Those yachts which departed from Key West in Florida are now leaving their first stopover in Montego Bay, Jamaica, today, also bound for the San Blas. I expect there will be a great reunion as the two fleets finally meet, renewing old acquaintances and making new friendships. And yet, the fleet will not yet be quite complete. 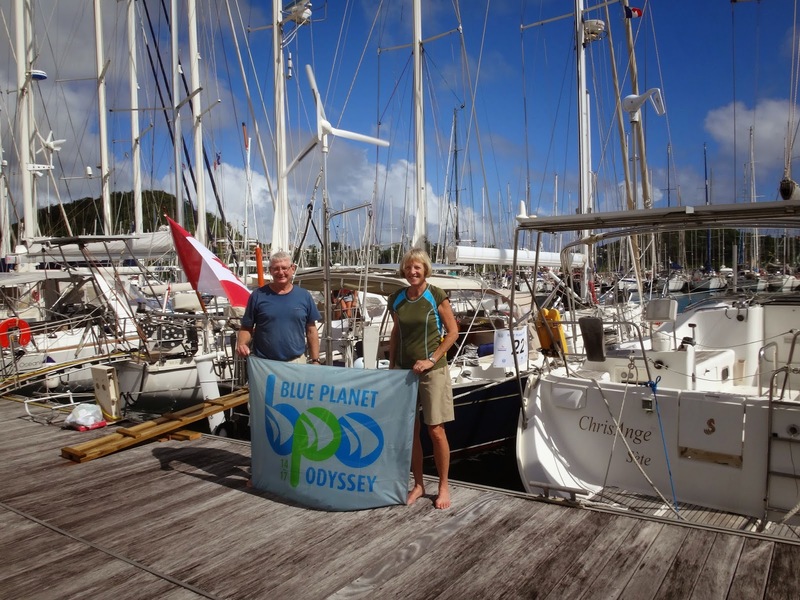 We will keep an eye on the west coast of the United States too, as Terry and Dena Singh on Libby prepare to leave within the week and head south to the Galapagos. Not far behind are Jerry and Ginny on Heron Reach, braving the winter weather to come south for the warmth. We expect they will meet up with everyone in French Polynesia. And finally, last but not least, Aventura is lingering in Florida ready to be exhibited at the Miami Boat Show. Come March she will head west into the Pacific to join everyone else in Tahiti. Hopefully she will be joined by the crew of Joyful and Gypsie, who unfortunately had to postpone their Key West departure but plan to catch the BPO up as soon as they possibly can. Mobay at last! 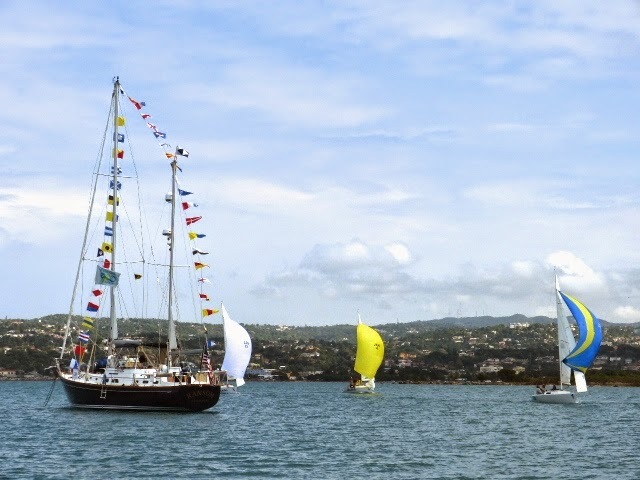 Ransom and her cruising companions, Tahawaus a 54′ ketch (Tahawaus means “cloud splitter”) and Chapter Two a 45 catamaran made it from Key West over to Havana, around the corner of Cuba down the endless South shore thereof and finally fetched up in Montego Bay where we have enjoyed the hospitality of the Montego Bay Yacht Club for the past few days. MBYC is a wonderful oasis in the middle of very busy Montego Bay. Some crew have enjoyed shore outings, some crew are occupied tidying up some loose ends in Ransoms mechanical department. Crew members Pip and Daphne were invited to race with MBYC fleet today. Provisioning day tomorrow, skippers meeting and cocktails in evening, then 10am start on Tuesday heading South hopefully with Easterly winds down to the San Blas Islands, 3 1/2 days under sail. We had the luxury of sleeping in today after arriving on Thursday. The crew (including me) began inspection of the boat and troubleshooting our radio antenna issues. I proceeded to cut fabric and make sun covers for different areas on the boat. Pat made sure that I had a sewing machine installed on our boat so that I can get my sewing fix. You raise the machine by pushing a button and it raises on a hydraulic lift. It is so cool. By mid afternoon, I was roasting so we aired up the paddle board and kayak and took a tour of the harbor. It was very fun and a great way to exercise. It definitely cooled me off because I was ready to get back to my sewing. In the evening, the Montego Bay yacht club hosted a cocktail party in our honor. 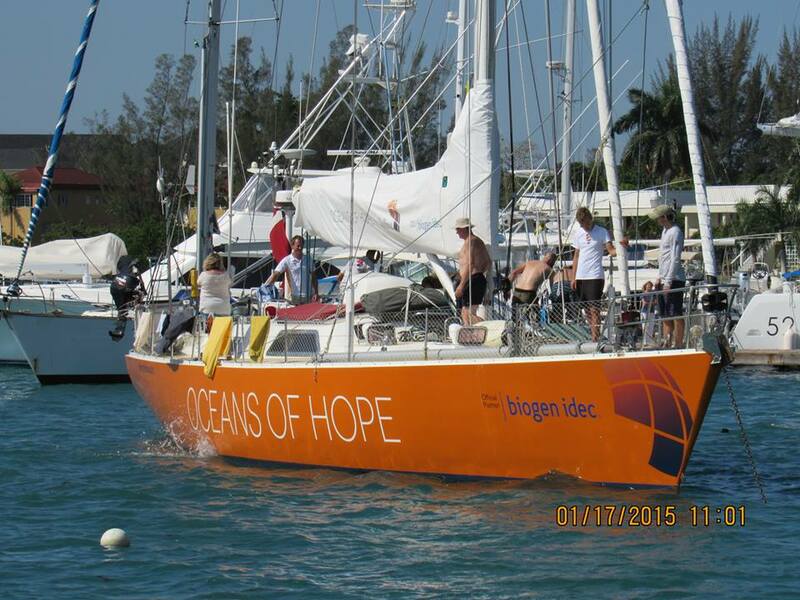 We met a group of people sailing around the world on a boat titled, “Oceans of Hope”. The founder, Mikkel Anthonisen, is a doctor from Copenhagen. His specialty is working with multiple sclerosis and neurology. The doctor decided to sail around the world raising awareness for the disease because so many patients couldn’t complete their dream of sailing after being diagnosed. The concept is that the boat is crewed by three qualified sailors. They allow six people with sclerosis to get on the boat in a port and ride to the next destination. They only have to pay for their airfare to and from the port of departure. We met the six individuals and crew which were headed to Panama. They are on a faster pace to sail around the world than we are. 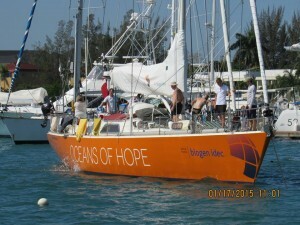 You can see more about their journey and cause at www.sailingsclerosis.com. 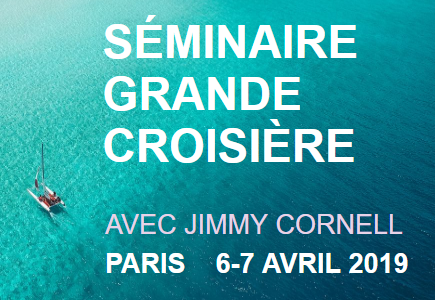 It’s exciting to meet other boats sailing around the world working toward a great cause and raising awareness. During this past week of preparations we have felt more like we are part of an event. Kathy and Roger have been here representing the BPO and helping with logistics. We have passed that ”final exam” to go and are looking forward to beginning. Tonight there was a skippers’ meeting with all our last minute instructions, weather, and other logistics. The local tourist board had a reception for us and our logbooks were distributed and signed by the mayor of Le Marin. We had an earlier meet and greet and many visits with Kathy and Roger. One night a local high school student gave us some tips on fishing. Hope we can catch something! I think we all would have liked more time to visit but everyone has been so busy doing last minute things. On Maggie we have repaired the main sail, added mast steps and installed the new life raft. We deployed the old life raft near the garbage as a demo and removed some of the emergency supplies for our use. Our courtesy flags are up and the BPO flag and splash guard with our number 22. Food and supplies are quite limited in San Blas so I have been buying as much food as I can fit into the boat and getting it packed away. 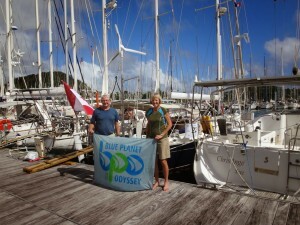 Jerry and Ginny left their home port of Bellingham, Washington on Sunday, January 11. Last news was that they were waiting out a gale at Neah Bay and will then ‘turn left’ and head for the Marquesas to meet up with the rest of the fleet.